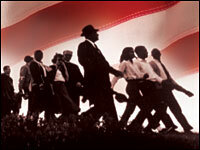 America's Civil Rights Years (1954-1965) is a documentary series about the American Civil Rights Movement. It originally aired on PBS in early 1987 with six initial parts; eight more parts were broadcast in 1990 as Eyes on the Prize II: America at the Racial Crossroads (1965-1985), for a total of fourteen episodes. It uses archival footage to record the growth of the American Civil Rights Movement, with special focus on the ordinary people who affected the change. It was produced by Henry Hampton at Blackside Inc. The series has been hailed as more than just a historical document. Clayborne Carson, a Stanford University history professor and editor of Martin Luther King Jr.'s papers, remarked that "it is the principal film account of the most important American social justice movement of the 20th century." Because of its extensive use of primary sources and the depth of coverage of the material, it has been adopted as a key reference and record of the civil rights movement. It took filmmaker Henry Hampton 12 years to bring Eyes on the Prize to television. When he did, the PBS documentary on the civil rights movement was a revelation for much of America. Nearly 20 years later, PBS will rebroadcast the series. The landmark 14-hour series, created and executive produced by award-winning filmmaker Henry Hampton, will air on American Experience in October 2006, as part of the acclaimed history series' 19th season. The first six hours of Eyes on the Prize will air three consecutive Mondays, October 2, 9, and 16, 2006, at 9 pm.